Oregon QSO Party, sponsored by the Central Oregon DX Club, 1400 UTC 7 May to 0200 UTC 8 May 2005 (7AM to 7PM PDT Saturday). Oregon stations work everyone, others work Oregon stations only. Work stations once per band/mode, mobiles again as they enter new counties. No repeater QSOs. Exchange: Send serial number plus county or state/province location. The serial number is a "QSO number" starting with 1. Scoring: 1 pt/SSB QSO; 2 pts/CW QSO. Score: multiply QSO points by total OR counties worked on each mode (max 72). Oregon stations multiply QSO pts by OR counties + states + provinces + DXCC countries (15 max. ; excludes W, KH6, KL7 and VE). 100 bonus points for working special club station K7O. 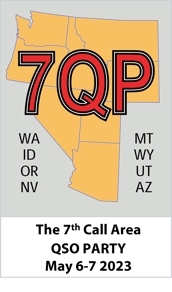 One extra multiplier for each 8 QSOs with the same OR county. Operating frequencies: 40 kHz up on CW, 50 KHz up on SSB - 3855, 7235, 14255, 21355 and 28455 on ssb. Send logs and summary sheet by June 10 to Oregon QSO Party, c/o CODXC, 61255 Ferguson Rd, Bend, OR 97702. Computer logs to logs@codxc.org -- any plain text format is acceptable. On the Website at www.codxc.org: Rules, County Signup sheet, Oregon Map, Summary Sheet, and files for use with CT and TR logging programs.